On Thursday, December 15, 2011, St. Basil the Great Scholarship committee’s meeting took place at Anglican Church of Canada in Toronto. Rev. Archpriest Zareh Zargarian, pastor of Holy Trinity Armenian Church and a board member was present at this important gathering of clergy and representatives from the Toronto School of Theology. It is with great joy that we announce this year’s recipient of this wonderful scholarship is a member of the Armenian Orthodox Church and recipient of Order of Holy See of Etchmiadzin. It is with the blessing and the decision of His Holiness Karekin II that the scholarship was given to Fr. Isahak Poghosyan who arrived in Toronto recently to continue his theological studies at University of Toronto. Fr. Poghosyan conveyed warm greetings’ of His Holiness to The Primate of the Anglican Church, The Most Rev. 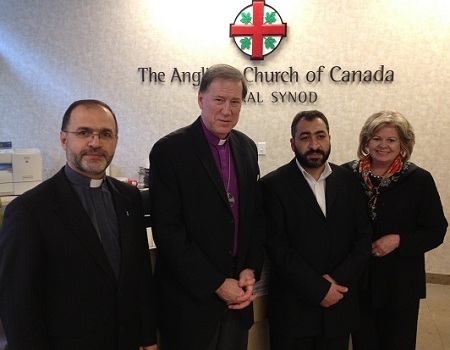 Fredrick James Hiltz and the Anglican Foundation of Canada’s executive director, The Rev. Canon Dr. Judy Rois. We welcome Fr. Isahak Poghosyan to Toronto and wish him a successful year ahead.